Youthful, picturesque and buzzing with energy – Budapest is more than just the capital of Hungary. After traveling Europe in the summer of 2014, Budapest left a mark on me. With its ruin bars, castles and thermal baths, there’s truly never a dull moment in this enchanted capital. If you’re a student or just generally trying to save some cash, it could be worth looking at hostels when looking for where to stay. Bonuses: save money for other awesome activities while meeting tons of cool travelers. When it comes to nice hostels, this place takes the biscuit. Ranging from $14 – $21 a night for a 10 bedroom dorm, this place is a steal. It’s located right within the city centre which provides for easy access to and from attractions. My stay here was very quiet for those of you who aren’t too keen on partying – hostels do tend to have that party reputation. The staff are welcoming and helpful, not to mention the hostel itself is wicked cool – how many receptions have white board walls? 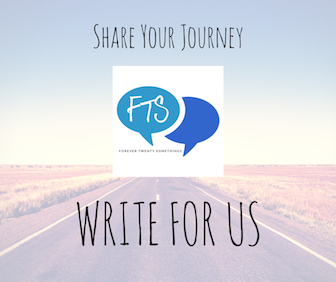 Make sure to leave your name signed as a memoir! From one extreme to the other, the Boscolo Hotel provides a romantic stay for you and your partner, or for those of you who enjoy the finer things. Not only is this hotel stunning to look at (never mind SLEEP in) it’s also located slap bang in the middle of the city. 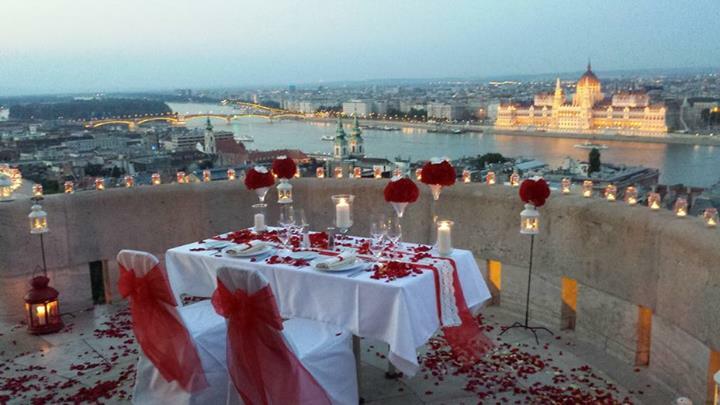 The 5 star hotel has been named as the most beautiful in Budapest – and are you surprised? Check out this dining hall! You’re guaranteed to enjoy every last minute of your stay. A nights stay in this palace range from $191 to $263. 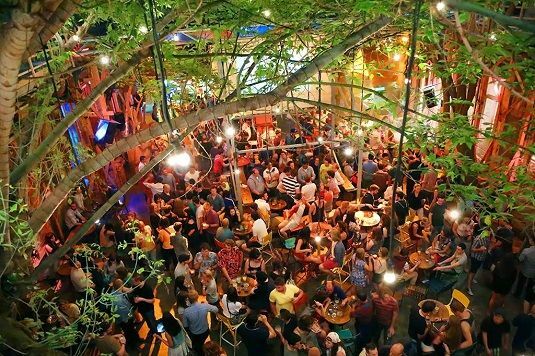 If you love partying, exploring nightlife and making new friends this hostel is the place for you. This hostel has zilch negative reviews, and was even nominated for ‘Worldwide Medium Hostel’ in 2015. 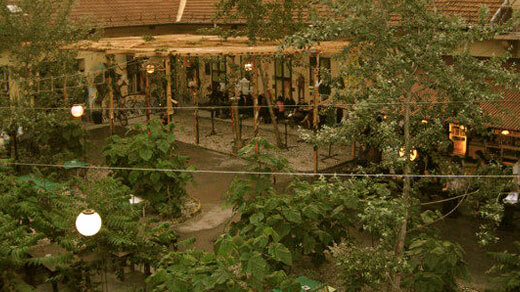 It’s located in Budapest’s 6th district – right in the heart of downtown and near all the major clubs. 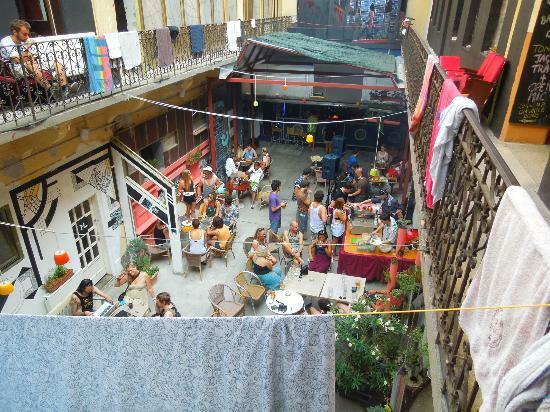 The hostel is covered wall to wall in graffiti provided by the best local street artists and has a backpackers bar in the courtyard for travelers all over the world to bond over their stories and, of course, over a beer. This is the place for those who love to stay up all night creating memories and living while they’re young. 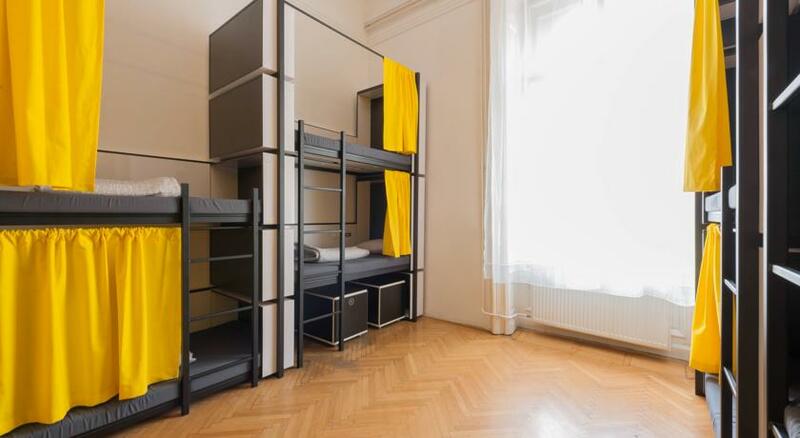 Prices for this hostel range from $10 – $14 a night. For reasonable prices and outstanding taste, the finest of Hungarian cuisine whilst also given the choice of modern bistro dishes. 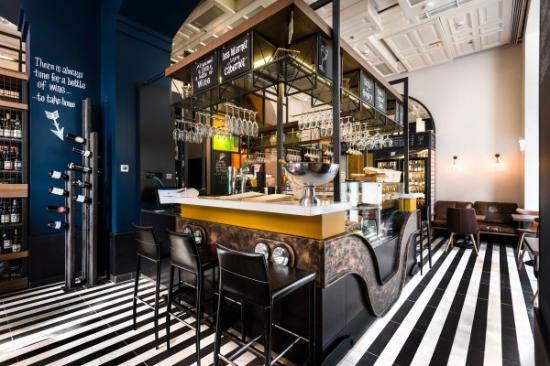 According to Tripadvisor, Bistro Fine is listed as the #1 place to eat in Budapest – combined with its modern setting and excellent location, Bistro Fine’s reviews will make it hard to pass up on your trip. The hidden gem of Budapest: buried deep within the streets of the capital and concealed by the hustle and bustle of tourist life, the Panorama Terrace is the perfect place to escape to experience exquisite dining whilst absorbing breath-taking views from a rooftop terrace. 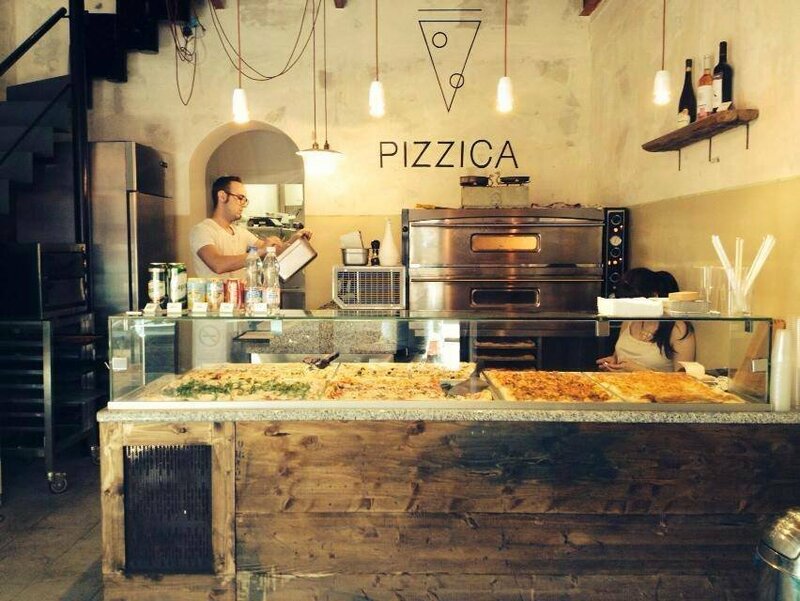 Referred to as the best pizza in Budapest, Pizzica gives you the option to sit down for a meal or takeout – who doesn’t love pizza in bed?! 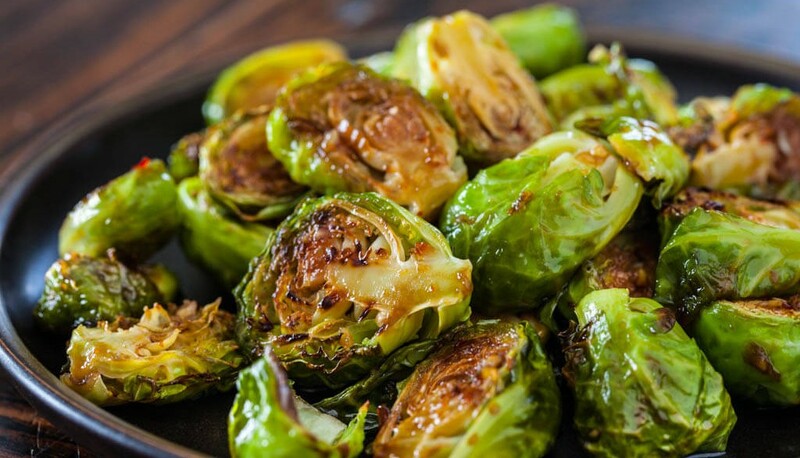 Pizzicia pizza is cooked fresh right in front of your eyes, and all for little cost. Such a bargain. 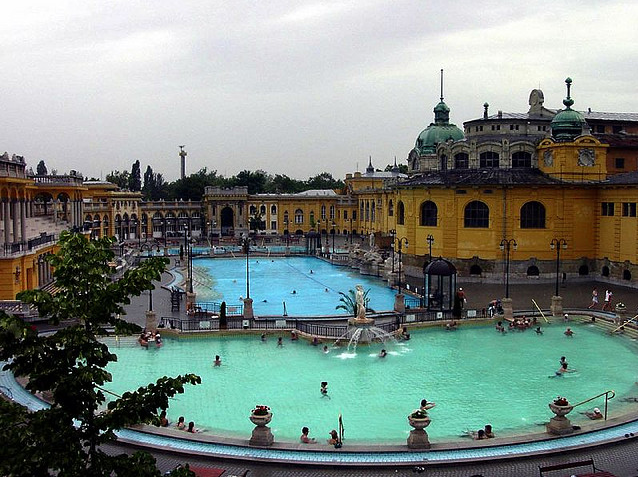 Listed as the top tourist attraction in Budapest and at only $20 for entry, the Szechenyi thermal baths are sure to counter for a fun yet relaxing day for those of all ages. The pools are heated, and there are plenty to choose from, and they allow you to bring in your own food and drink if you want to save instead of purchasing it there. Don’t forget to pack sun cream and a book! 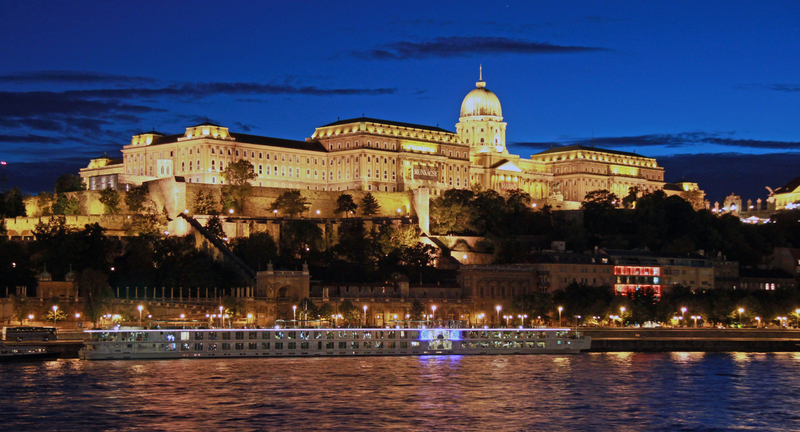 Dating back to 1265, Buda Castle is an official UNESCO World Heritage site that has been home to the many kings of Hungary over the years. After crossing the bridge from Buda to Pest, you’ll find a choice of either cable car or walking (walking is my preference). It doesn’t take too long and the views are spectacular. Be sure to take a free tour round the castle museum and bask in over 800 years of history! 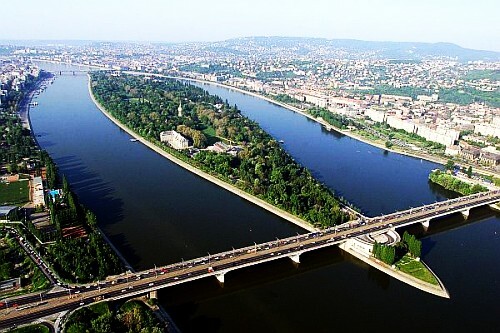 The Central Park of Budapest: Margaret Island is located on the River Danube and is easily accessible by walking over the Margarita Bridge or by boat. The island has free entry, wonderful botanical gardens, and even a small zoo for you to explore. There are also bikes available to rent for a ride around the island! Did somebody say Hogwarts? If you’re an architecture nerd, look no further. This beautiful landmark provides for another history lesson on Budapest, not to mention the spectacular panoramic views on the city. Also another angle for you budding photographers to snap at! 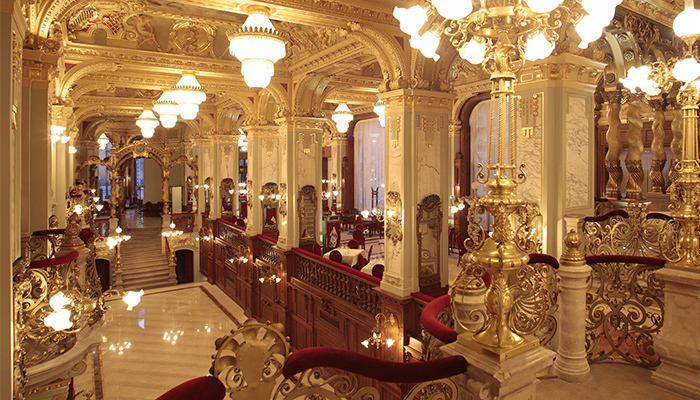 A walkable distance from the city centre, the Hungarian State Opera House is stunning, both inside and out. Prices for shows are fairly low compared to other places around Europe. 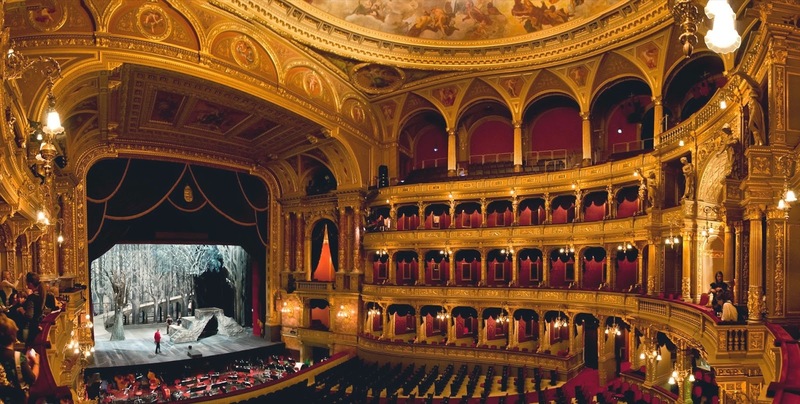 Whether you chose ballet or opera your show will be undoubtedly stunning. If you’re a real party-goer, it’s definitely worth looking into some of the bar crawls Budapest has to offer. Bar crawls are the most efficient way to see the best bars the city has to offer, not mentioning the free entry and drinks you get all for just $11. You and other travelers alike can embark on a night of discovering the best ruin bars and clubs Budapest has to offer. You even get a free t-shirt as a memoir! 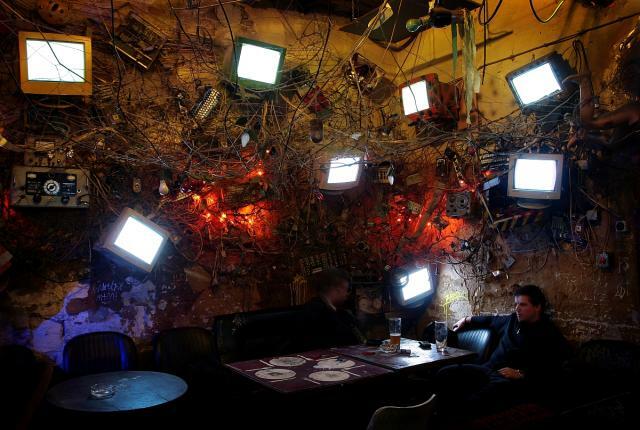 Szimpla Kert is the #1 ruin bar in Budapest, so it would be silly not to check it out. For those of you who don’t know, a ruin bar is a type of bar Budapest is famous for. It is literally ruined, with trees up the walls and across the ceilings. You basically feel like you’re in an enchanted forest or something. With alcohol. Which is awesome. This ruin bar strays away from the traditional stereotype by having a club vibe to it. This means you can either have a chilled drink at the bar or boogie on down on the large dancefloor! Fogaz Haz also has live music regularly for customers to enjoy. Grandio is a bar in a party hostel located within the city centre, which means cheaper drinks and opportunities to meet other travelers. Look at that garden! 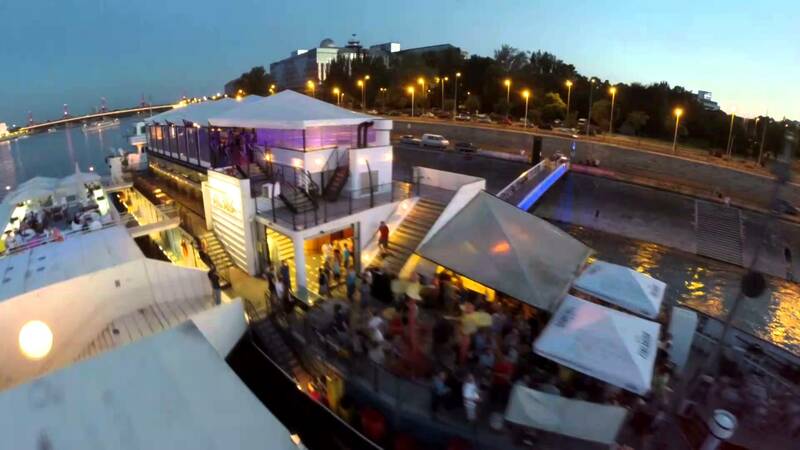 The coolest thing about this bar is that it’s on a boat set on the river Danube. The bar is open to the public and offers live bands from all over the world in the downstairs area. A floating venue is pretty cool right? 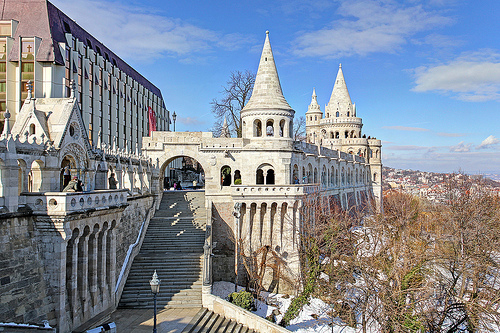 Budapest is a wonderful city thriving with culture combined with fresh and upbeat vibes. Whatever you chose to do during your trip to the Hungarian capital, adventure awaits you! 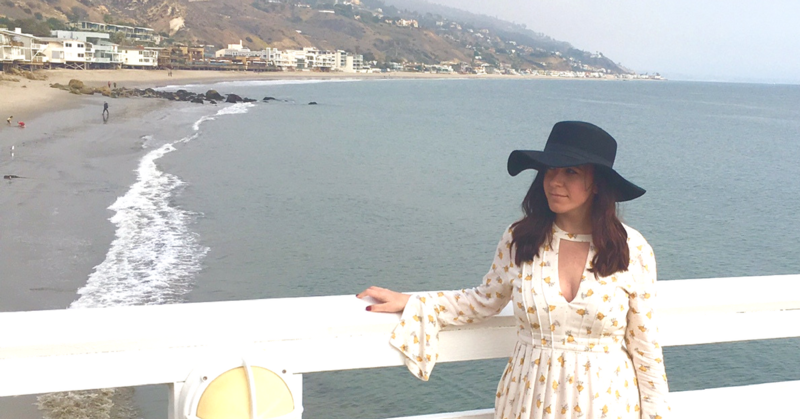 It’s sure to be a vacation you’ll never forget.